Good morning and welcome to the latest chapter of the continuing and depressing news. Do any of you remember a photo I posted last year, of Paris streets and muslim prayers? You recall the dismal scene surely. Lets take a look again. Oh wait, this isn’t Paris, France. A Blitz of a different sort, but a Blitz nonetheless. It isn’t a race issue why so many Brits do not recognize the country they grew up in. And the current kiddies in school are being taught that there isn’t anything wrong and all is normal in their country. It’s a damn lie but the future liberals in training will buy into it. Be sure and see the link for all the photos. Set aside the fact that our Queen is the Defender of the Christian Faith. Ignore the 26 Church of England bishops who sit in the House of Lords. Pay no attention to the 2011 Census that told us 33.2 million people in England and Wales describe themselves as Christians. For if you want a more telling insight into religion in the United Kingdom today, just look at these photographs. The story they tell is more revealing than any survey. When the church was built in the early 18th century, it was designed to seat 1,230. Numbers are similar at St Mary’s, opened in October 1849. Then, it could boast a congregation of 1,000. Today, as shown in the picture, the worshippers total just 20. While the two churches are nearly empty, the Brune Street Estate mosque has a different problem — overcrowding. The mosque itself is little more than a small room rented in a community centre, and it can hold only 100. However, on Fridays, those numbers swell to three to four times the room’s capacity, so the worshippers spill out onto the street, where they take up around the same amount of space as the size of the near-empty St Mary’s down the road. What these pictures suggest is that, on current trends, Christianity in this country is becoming a religion of the past, and Islam is one of the future. In the past ten years, there has been a decrease in people in England and Wales identifying as Christian, from 71.7 per cent to 59.3 per cent of the population. 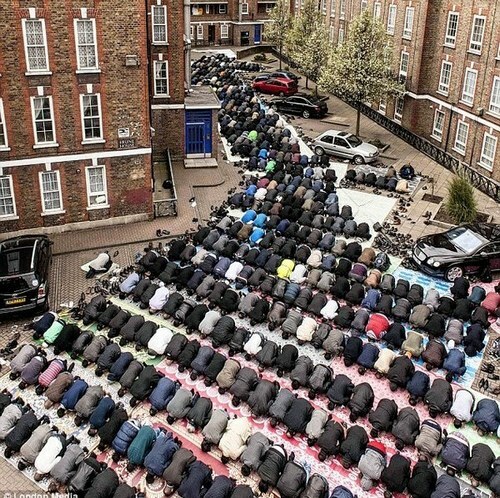 In the same period the number of Muslims in England and Wales has risen from 3 per cent of the population to 4.8 per cent — 2.7 million people. And Islam has age on its side. Whereas a half of British Muslims are under 25, almost a quarter of Christians are approaching their eighth decade. It is estimated that in just 20 years, there will be more active Muslims in this country than churchgoers — an idea which even half a century ago would have been utterly unthinkable. Many will conclude with a heavy heart that Christianity faces a permanent decline in Britain, its increasingly empty churches a monument to those centuries when the teachings of Christ governed the thoughts and deeds of the masses. On Sunday October 1, 1738, St George’s was packed twice during the day to hear the great evangelist John Wesley, who then preached at the church for the following week explaining, as he put it, ‘the way of salvation to many who misunderstood what had been preached concerning it’. Today, there are no John Wesleys to fill up the pews. The church does its best, offering, for example, a monthly ‘Hot Potato Sunday’, during which the few congregants can discuss the readings of the day over a baked potato. Unless they can reinvigorate their congregations they may finally end up being deconsecrated. When that happens, such large buildings will be attractive spaces for those who can fill them. One day, in a few decades, St George’s may well again be packed with worshippers — but they will not be Christians. And I have personally seen this. In the real estate section of a Hampshire paper, which is several pages long, there are photos and ads for former churches, turned into private homes. The bigger churches are even sub divided as rentals as well. It’s a sad sight and I am not even religious. I can guess the same happens back home in the USA in some communities, although I haven’t heard of it. But it must surely happen there as well.